Jesus Healed Man That Was Lowered Through The Roof! There are so many printables available for this lesson, so I decided to create this project to use after the lesson and they really enjoyed it! It can be used for several different lessons, and it can used for any group discussion activity. We discussed being the kind of person that Jesus wants us to be and things we can do to help our friends and neighbors. 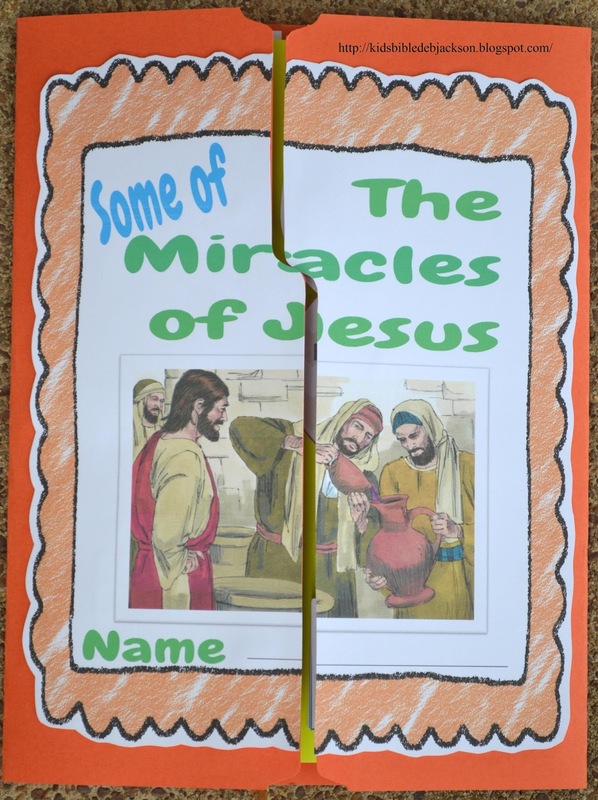 Last week we learned about the first miracle Jesus. He was at a wedding feast and His mother Mary told Him they were out of wine. Jesus told the men to fill the posts to the top with water and when they poured the jugs, Jesus had turned the water to wine! The second miracle Jesus did was to cure a nobleman's son. Jesus didn't even go see him and Jesus made him well! We talked about Jesus healing a man with leprosy, a woman had a problem and she just touched Jesus' garment to be healed! Jesus even brought the 12 year old daughter of Jairus back to life! Jesus did miracles to prove who He was. A miracle is an act of God. Today, we are going to learn about a couple more miracles. Our scripture for today is Mark 2:1-12. Jesus is on Capernaum and when He entered the house, people immediately came to see Him! So many people gathered together that there wasn't any more room! The doorway was full of people! Jesus was preaching to the people. There were also Pharisees and priests in the house. There were four men carrying a man that was paralyzed. (Dictionary: Someone that is crippled and disabled) They wanted to get close to Jesus, but the house was so full of people, that they couldn't get to Him. When they couldn't get near Jesus, they went to the roof, and uncovered the roof. When they had broken a space big enough through the roof, the four men let the man down through the roof! When Jesus saw their faith, He told the paralyzed man that his sins were forgiven. Some of the scribes thought to themselves: Who does He think He is? Only God can forgive people of their sins!" Jesus knew what they were thinking and asked them if it was easier to say "Your sins are forgiven" or "Get up, take your bed and walk"? But, so you know that the Son of God has the power to take away sins, Jesus told the paralyzed man to "Get up, take your bed, and go to your house!" Today's Bible verse tells us that Immediately he arose, took up the bed, and went out in the presence of them all, so that all were amazed and glorified God, saying, “We never saw anything like this!” People were constantly amazed at the power Jesus had! Mark 3:1-6 One more miracle we will discuss today happens when Jesus went to the synagogue on the Sabbath. There was a man in the synagogue that had a withered hand. 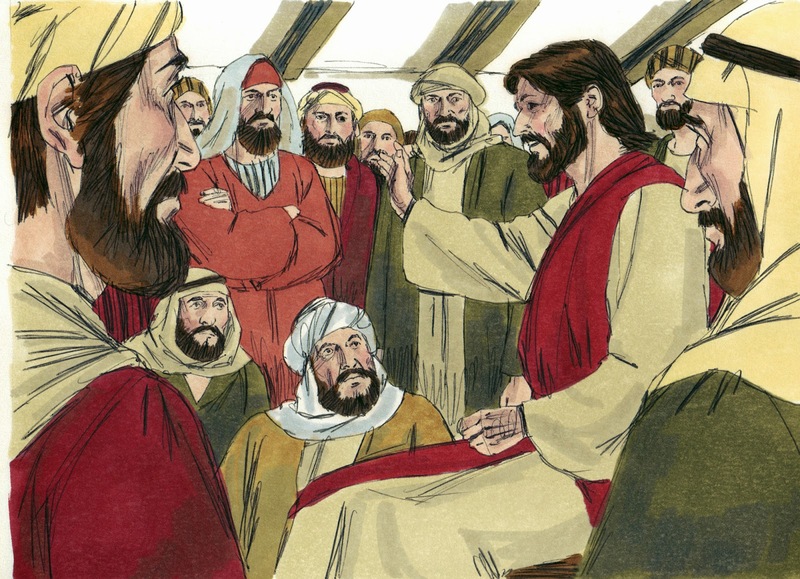 The Pharisees were watching Jesus to see if He would heal on the Sabbath. It was against the Old Law to do any work on the Sabbath. They wanted to see something that they could accuse Jesus of doing wrong. Jesus told the man with the withered hand to step closer to Him. Jesus asked the Pharisees if it was lawful to do good or evil, or to save a life or to kill on the Sabbath. But they didn't answer Jesus and Jesus was upset that they had hard hearts. Jesus told the man to hold out his hand, and when the man held out his hand, it was as whole as his other hand! This application worksheet was added in 2016. It has the same theme as the project below, but is a simple easy-to-print and go fill-in-the-blank worksheet. This includes the color and the black & white. Click here to download. 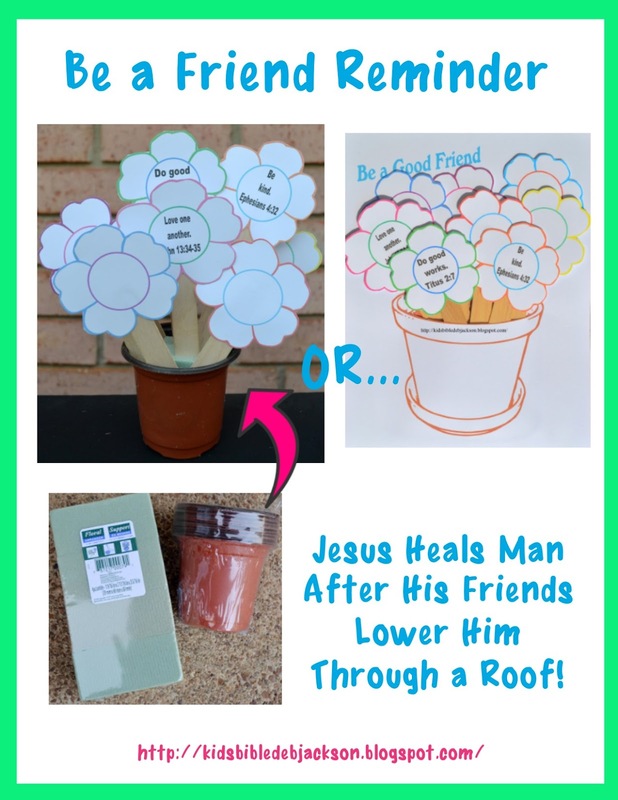 For today, I decided to do a fun project, partly because I had the worksheet last week and it was a lot of writing, and because I thought I would discuss ways that Jesus wants us to be to our friends and neighbors. There is a paper flower pot for you to print, or you can purchase the pots and floral foam to stick the flowers in. If you do not want to use the craft sticks, the kids can glue the flowers onto the paper and draw stems and leaves. You can print it all in color or black & white here. Click on the above picture to print the worksheet. You can find more printables and ideas for this lesson by clicking on the above picture. Today's Bible Verse: Immediately he arose, took up the bed, and went out in the presence of them all, so that all were amazed and glorified God, saying, “We never saw anything like this!” Mark 2:12 (NKJV) Click on the picture to print the NKJV Bible Verse & Teacher's Visual. Yah! This post is listed at Free Homeschool Deals! I've always loved this story. It's just so awesome! Debbie I always appreciate your ideas. Mostly I have been teaching preschool so I'll be back to check out those posts soon! I love your be a friend craft! You always have such clever ideas =) Thanks for linking up at TGIF! Thank you Beth! I appreciate the comment! Thanks I'm using the flower pot craft for our kids club at church!